At the dawn of the automobile age, Americans' predilection for wanderlust prompted a new wave of inventive entrepreneurs to cater to this new mode of transportation. Starting in the 1920s, attention-grabbing buildings began to appear that would draw in passing drivers for snacks, provisions, souvenirs, or a quick meal. The architectural establishment of the day dismissed these roadside buildings as "monstrosities". Yet, they flourished, especially along America's Sunbelt, and in particular, in Southern California, as proprietors indulged their creative impulses in the form of giant, eccentric constructions -- from owls, dolls, pigs, and ships, to coffee pots and fruit. Their symbolic intent was guileless, yet they were marginalized by history. But, over the past 40 years, California's architectural anomalies have regained their integrity, and are now being celebrated in this freshly revised compendium of buildings, California Crazy. 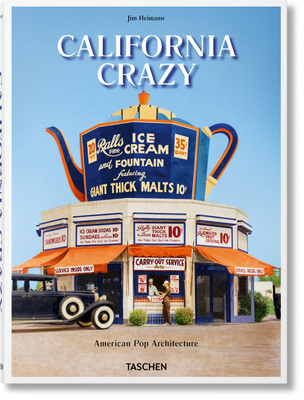 Brimming with the best examples of this architectural genre, California Crazy includes essays exploring the influences that fostered the nascent architectural movement, as well as identifying the unconventional landscapes and attitudes found on Los Angeles and Hollywood roadsides which allowed these buildings to flourish in profusion. In addition, California Crazy features David Gebhard's definitive essay, which defined this vernacular movement almost forty years ago. The California Crazy concept is expanded to include domestic architecture, eccentric signage, and the automobile as a fanciful object.